As you probably already know, our third and last post-launch Trajectory Correction Maneuver (TCM-3), a cleanup tweak of about 2.6 miles per hour, was successfully executed on March 9. TCM-3 featured the first in-flight closed-loop burn control, in which the onboard navigation system senses the acceleration of the vehicle and targets the burn cutoff for a precise change in velocity. This worked entirely as advertised, and it's a capability we plan to use in future burns, rather than just conducting the burn with a timer. On the day following TCM-3, the mission control team uploaded the Command Loss Time Safety Net (CLTSN), which is the autonomy "catcher's mitt" code that I wrote about last month. Also this month, we have continued the in-flight testing of our SWAP and PEPSSI plasma instruments. SWAP passed a major milestone on March 13 by successfully opening its launch door — on the first try, I might add. That's the second launch door to open, since Alice opened hers in late February. Still to come are the Ralph and LORRI doors, which will open later in the year when we are farther from the Sun and these instruments no longer need such strong protection against accidental Sun pointing. Another important activity that has been carried out of late is the just-completed check of the high-gain antenna and its associated electronics that we'll rely on very heavily for communications in the outer solar system. Also, the Student Dust Counter (SDC) was turned on and commissioned in its entirety in March. SDC is kind of like an acoustic sensor that picks up impacts by micrometeoroids on its surface. But SDC can also hear background noises on the spacecraft, such as engine firings, thermal noise (like the popping and cracking sounds you hear from your car when the engine is hot) and the opening of instrument doors. In fact, SDC clearly heard the opening of SWAP's launch door on March 13. The instrument is now collecting data on tiny impacts occurring along our route of flight to Jupiter. In the coming few weeks we plan on additional testing of LORRI camera and the "first light" (or more properly, "first particle") observations for SWAP, as well as the first turn-on of the Ralph imager/infrared-spectrometer, and the first of two significant updates of the spacecraft Command and Data Handling (C&DH) software. In a milestone of sorts, on April 6, we'll cross the orbit of Mars — that's just 10 weeks after launch, folks. By comparison, the Mars Reconnaissance Orbiter took 5.5 months to get there, arriving (successfully!) into orbit on March 10. Meanwhile, the New Horizons science team is finishing up our final list of Jupiter observing plans, and the ground team is completing a major upgrade of the mission control software, while simultaneously working on planned software bug-fix upgrades for our onboard Guidance and Control (G & C) and autonomy systems. These bug-fix type upgrades are normal for a mission in early flight; we're finding the same kinds of little "this and that" software anomalies, features and idiosyncrasies that most missions find when they finally get to operate in the real flight environment. The autonomy upgrades are planned to be uplinked in May and June. The G&C software will go up late in the summer. Back over at Pluto, the same Hubble Space Telescope team that found Pluto's two small moons last year, measured the color of those moons. I led that effort. What we found is that both the outer moon, called S/2005 P 1 (or more colloquially for the time being, "Baltimore") and the inner moon, called S/2005 P 2 (or more colloquially for the time being, "Boulder"), are the same color as one another, and as Pluto's far larger moon, Charon. 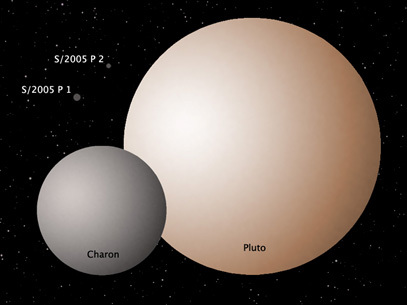 The figure below illustrates this, as well as the fact that Pluto's color is reddish in comparison to its satellites. Some things we do not yet know, but would love to find out in future observations, are the shapes, rotation periods and overall reflectivities of Pluto's small moons. Stay tuned. 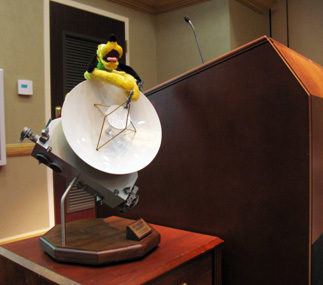 We're hoping HST awards more observing time soon. depicted based on HST observations made on 2 March 2006.